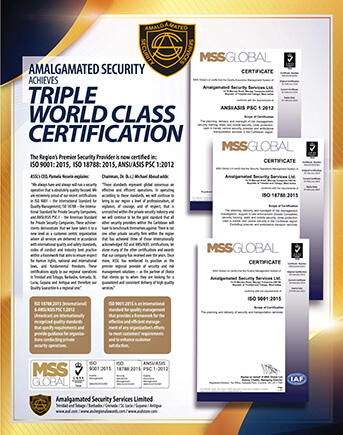 Amalgamated Security Services Limited (ASSL) a premier provider of Security and Risk Management Services within the Caribbean region achieves triple world class certification; ISO 9001, ISO 18788 ad PSC-1. The company successfully completed Stage 1 and 2 audit conducted by MSS Global and achieved certification on 26th February, 2019 for a three (3) year period. Over the past year, ASSL management lead by Chief Executive Officer, Pamela Hosein, integrated the principles promoted by ISO 9001:2015, ISO 18788:2015 and ANSI/ASIS PSC-1:2012 within the company’s operations. This included its eight (8) business units; Guard Service, Electronic Security & Integrated Systems, Prisoner Transport Division, Archangel Ambulance, Firearms and Cash Management, Central Monitoring Station, Investigative Unit and Geospatial Technology Division. We at ASSL view this achievement as yet another milestone demonstrating our dedication to our employees and stakeholders. consistency with voluntary commitments to which it subscribes. 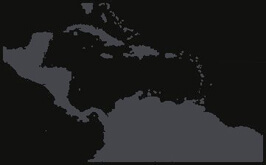 ANSI/ASIS PSC.1-2012. is a management standard for quality of private security company operations.The standard seeks to operationalise the International Code of Conduct (ICoC) within a formal structure familiar to businesses. That structure, with national and international supervision, provides auditable procedures for the development of the standard, certification to it, and monitoring of ongoing compliance. It incorporates elements of the Montreux Document.